Tricia Gosingtian loves her adorable Kate Spade Cat's Meow Hazel! The exact bag isn't on the brand's official site anymore, but you can spy a similar furry friend version here for $258 (P13,572.09). All eyes on that pretty rose-shaped turnlock! Nicole Andersson's stylish Coach Parker with Rivets and Snakeskin Detail purse goes for a modest $450 (P23,672.25). What we like most about Laureen Uy's Marc Jacobs Snapshot Camera Bag is that you can cop any of the ultra-fun colorways and funky strap options for just $295 (P15,518.48) across the board. Enjoy mixing and matching! Rhian Ramos' adorable little Furla Metropolis Mini crossbody is the ideal travel sling. It's perfect for both daytime tours and exploring any new city's nightlife! Snag one of your own for AUD $499 (P19,224.50). The stuff of minimalist, architectural dreams, Camille Co's pristine white Danse Lente Johnny bucket bag costs just $385 (P20,258.70). Sleek beyond belief. 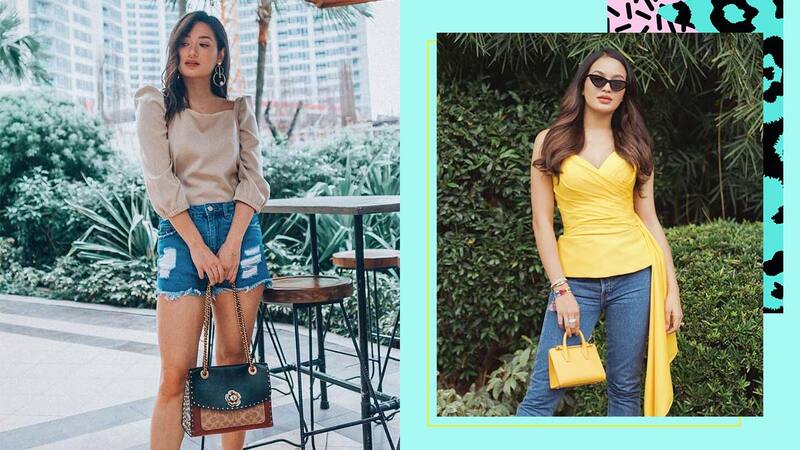 Sarah Lahbati's Strathberry Nano Tote in Blossom Yellow is still up for grabs on the label's online shop for GBP295 (P19,926.13). This thing's tiny, but it sure packs a punch!